Baked potatoes are the ultimate comfort food, but they can take 45 minutes or more to cook in the oven. Microwave cooking can be quite a bit faster, but it can yield potatoes that are too mushy, shriveled, or partially raw to be appetizing. One great solution is to sew a potato bag you can use in your microwave. Why Sew a Potato Bag? When you cook a potato in the microwave, the results can be unpredictable. If the potato loses too much moisture while cooking, you can end up with a dry, shriveled lump. If it doesn't cook evenly, you can end up with parts of the potato that are scalding and other parts that are still raw and crunchy. Luckily, if you're handy with a sewing machine, you can make your own bag to help insulate the potato and retain its moisture as it cooks. These bags are affordable and easy for the novice seamstress, and they make great hostess gifts and stocking stuffers. You can make these potato bags for less than two dollars apiece. They take about half an hour to construct, and you could easily make several in an afternoon. You'll be able to fit about two medium-sized potatoes in the bag. Lay your fabric out with the right sides together. Place the quilt batting on top of the fabric stack, and secure all four sides with pins. Use your sewing machine to sew around two of the long sides and one of the short sides, leaving a half-inch seam allowance. Turn the bag right side out, and press it with the iron. Turn the remaining open end in, and secure with pins. Insert a short piece of cotton cord in the middle of this side. Top stitch this end closed, and securely sew the cord in place. Turn the fabric so the unbleached muslin side is facing up. Orient it so the end with the cotton tie is facing away from you. Fold the bottom end up to about two inches from the top end. Pin in place. Topstitch the sides to secure the fabric in a bag shape. Hand sew a second tie to the front of the bag, about two inches from the top edge. 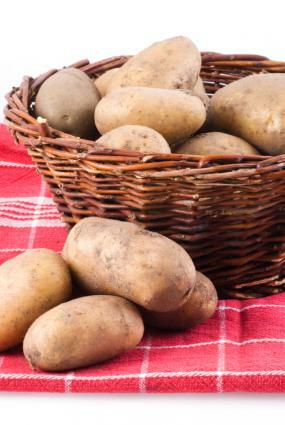 Wash two potatoes thoroughly, and dry them with a piece of paper towel. Wrap the damp piece of paper towel around the potatoes, and insert them into the bag. Tie the top of the bag closed. Place the bag in the microwave, and cook for several minutes. Each microwave is different, so experiment to find the perfect amount of time for your microwave. Carefully remove the hot potatoes from the bag, and serve them. Select only cotton fabrics and materials for this project. Some synthetics react poorly to being microwaved, and they may also release poisonous gasses when heated. If you're concerned about pesticides and dyes, select organic cotton fabrics and other materials for your potato bag. Never use a button or other zipper to close your potato bag. If these closures include metal, they can damage your microwave and present a safety hazard. For the outside cotton fabric, choose a pretty print that matches your kitchen colors or a favorite apron. If you want to add extra flair to your potato bag, consider appliqué. You can attach a pretty piece of fabric in a fun shape to the outside of the bag. A potato bag is a great tool to help you prepare quick, healthy meals for your family. In addition to making a routine chore quick and easy, a potato bag is a great reusable kitchen tool that is environmentally friendly.